Almost 10000 entries need 400 judges and almost 50 judging days all across the British Isles, to give stars to some of the best food in the world – wow! Run by the Guild of Fine Food, we posted our little bag of flour off to Dorset in April to be baked and blind tasted by at least 12 judges. A few months later we got a sentence back from the judges “… It made a perfect loaf of bread, well-risen, with good texture and crust. Delicious, fresh, slightly earthy flavour” and our Strong Wholemeal Flour was awarded not just one, but 2 Stars. 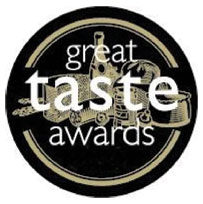 Only a handful of Kent’s food producers got Stars this year, so we are over the moon! In the meantime, things have been afoot on the farm. Hemings Bakehouse is currently setting up a new bakery on the farm, and we have a new mill. So in the autumn, we’ll be milling wholemeal and white flour, and Phil the baker will be baking it into fabulous fresh local loaves within sight of the fields which grow the wheat! As both Phil and we sell through Farmers’ Markets, we’re planning on pooling resources to get more loaves, flour and oil out to more customers. As most shops only need a few bags of flour at a time we will be offering retail bags of flour through the wholesaler Cheeseworks, and at a few local farm shops. If you’d like to try our flour, ask your local farm shop or deli in Kent or Sussex if they order from Cheeseworks, if so, they should be able to get hold of some for you. Harvest has ground to a halt due to rain and showers in the last few days. All of the rapeseed is harvested and about 60% of the wheat. Hopefully we’ll get some dry settled weather next week and can finish harvesting wheat and oats. This entry was tagged artisan flour, bakery, bread, flour, Great Taste Awards, Hemings Bakehouse, kent, Kentish flour, Produced in Kent, pure kent, strong wholemeal flour, wheat. Bookmark the permalink.